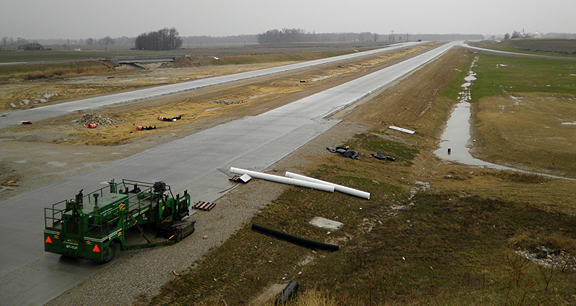 Project obstacles and solutions: Texas Gas hired Miller Pipeline to relocate natural gas pipelines under the new construction of I-69 near Fort Branch, Indiana. It was determined that imix Flexifill would be used as structural fill for the pipes instead of stone. Since they are running under the interstate lanes, Miller Pipeline needed a fill that was easy to compact but could be removed if the pipelines needed to be replaced in the future. Since imix Flexifill is a self-leveling, self-consolidating mix, there was no compaction equipment needed. In all, IMI provided 1,200 yards of imix Flexifill to cover the pipes to a depth of 10 feet. IMI was able to provide 100 yards of Flexifill per hour. To learn more about imix Flexifill, click here.